Many years ago I would look at pictures of the Andromeda galaxy (such as the one above) and lament that the Earth isn't closer to something like that, so we could enjoy its spectacular beauty in our night sky. Then I realized that we are close enough. 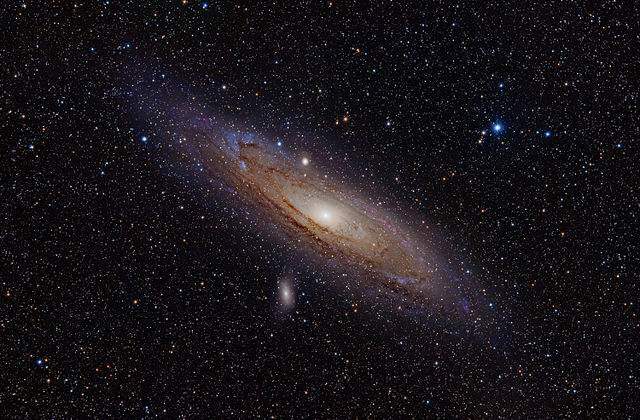 The Andromeda galaxy takes up a much wider stretch of our night sky than does the full moon. A composite photo on NASA's Astronomy Picture of the Day website (link) makes this obvious. Even from a couple of million lightyears away, it's plenty big enough to see, but it's just too dim. Another example: Much of the constellation Orion is taken up with beautiful nebulae, clouds of dust and gas that emit light or reflect it from nearby stars, but except for a smudge of light south of Orion's belt that looks glorious even in a small telescope (link), they're also too dim for our eyes to see. The closest galaxy is the Milky Way, so close that we're inside it, and it stretches across the whole sky. A wide-angle, long exposure photograph looking toward the galactic center can be awe-inspiring (link), but unless you're gazing up into a clear, dark sky away from urban light pollution, you're lucky even to see the Milky Way with the unaided eye. Update: With a camera, on the other hand, it can be spectacular, as in NASA's Astronomy Picture of the Day for 2015 April 13 (link). Incidentally, while the apparent brightness of extended objects is independent of distance, that's not true of individual stars; how bright they look to us is distance-dependent. For both distant stars and extended objects, the closer they are, the more light our eyes (and cameras) collect. But except for our Sun, stars are far enough away that they still look like points, and the light remains concentrated on a single light-sensitive retinal cell or a single film grain or photo site (pixel) on an electronic imaging sensor. On the other hand, if we're close enough to see a star as a visible disk (as in the case of our own Sun), its apparent brightness is the same regardless of distance. Mars is about half again as far from the Sun as we are, but the Sun's disk in the Martian sky would look just as bright to an astronaut on Mars as it does from Earth. Of course, the disk would also look smaller, and all else being equal, you'd need a little more than a stop additional exposure to shoot a sunlit photo on Mars versus Earth. It's perhaps a pity that we don't have eyes like lemurs', or even better the size of satellite dishes, but we can at least take joy in the fact that our scientific instruments let us see the beauties of nature that would otherwise be hidden. Update: NASA's Astronomy Picture of the Day for 2015 August 11 (link) has a nice photo of the Andromeda galaxy rising over the Alps. The core is clearly visible (as noted above, it's bright enough to be seen even in urban areas if you know where to look), and the spiral arms can be seen as a fainter region of brightness on both sides. As the accompanying text points out, the light from the galaxy has been traveling two million years, and it's likely the oldest light visible to the unaided eye.